Casa del Pozo Boutique Hostel is the perfect place to discover Cartagena de Indias. Our hostel has: an amazing bar/restaurant where our guests are spoiled with delicious food and fresh drinks, a cozy pool with bar area to chill at during the warmest hours, and a relaxing area with A/C, 58' TV with Netflix, Internet station, books and more. Our hostel is located in Calle del Pozo, just beside the vibrant Plaza de la Trinidad. This Plaza is the hub of the coolest neighborhoods in Cartagena, Getsemani. 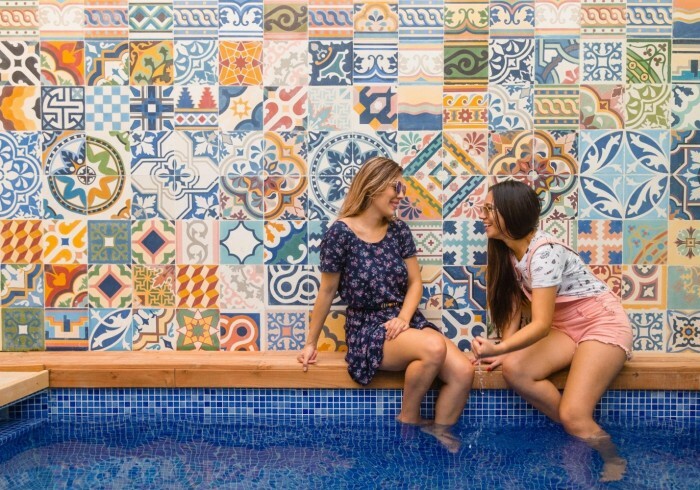 Casa del Pozo Boutique Hostel is the brand new solution for your stay in Cartagena; we are located in the heart of Getsemani, the bohemian part of Cartagena. We are a 2 mins walk from Plaza de la Trinidad, 10 mins from the Walled City and 15 mins from the beach. We are in a very strategic location close to all the main tourist attractions. For your stay in Casa del Pozo Boutique Hostel you can choose between a private room or a bed in a 6-bed dormitory. Our beds are made keeping in mind all the needs of a backpacker: reading light, 2 usb plugins for electronic devices, shelf for laptop, curtain for your privacy, and a private locker. By staying with us you get tons of daily freebies, including the delicious breakfast until 11, two free drinks during Happy Hour , free Salsa classes, free Spanish Language Survival Course, and least but not last free WiFi!! It's forbidden to bring inside the hostel alcohol and drugs.